Let me be blunt. I doubt I will have a better, more enjoyable meal in 2015 than I did at La Caravella earlier this summer. The restaurant, right at the entrance of beautiful Amalfi, is not famous for bluster or its media buzz, and so is one of Italy’s least known fine wine destinations. And yet, it has been around since 1959. La Caravella is also the first restaurant of Southern Italy to have ever been awarded a Michelin star, which it still holds today. The ingredients used are first rate and the cooking knowledgeable, talented and precise. Most importantly, La Caravella is one of those rare places where you immediately realize there is true talent at the stoves, capable of letting every ingredient in your dishes sing its own tune, exploding from the plate in all their intense, aromatic glory. Only truly gifted, and very few, chefs really ever manage this (including many big names with three star Michelin and World's 50 Best Restaurant awards that are often more about flash than substance). Owner Antonio Dipino has created a culinary masterpiece, a mecca for serious foodies everywhere. Frankly, it says a lot about today’s superficial, technology-driven society that La Caravella isn’t talked a lot about much more than it is. La Caravella’s wine list deep and exciting. There is no better Coda di Volpe in Italy than Vadiaperti’s; in fact, for my money, it’s one of Italy’s 25 greatest white wines. The 2012 Vadiaperti Coda di Volpe Irpinia is less thrilling than the amazing 2013 version, but it’s still beautifully mineral and lemony, pure and penetrating and a perfect way to start a meal or to accompany fish dishes of almost any kind. It cut through the richness of the calzoni and the croquettes dish effortlessly, driving but also softening the latter’s anchovy colatura flavors along. 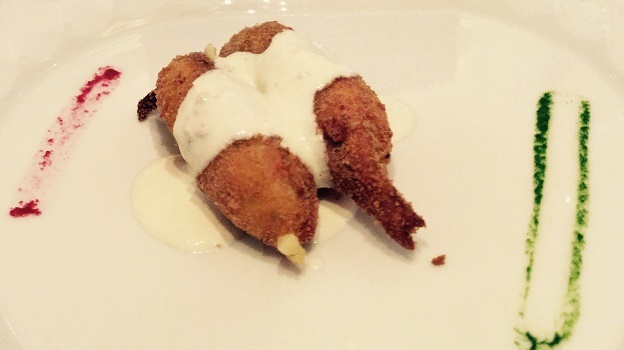 The croquettes will effortlessly make my “Top 10 dishes of the year” award at year’s end. I could have easily eaten three or four more portions. Readers might like to know that colatura di alici (anchovy colatura) is a typical Campanian seacoast sauce that derives from the garum of the ancient Romans, a flavoring made from fermenting anchovies left in the sun: though that may not sound appetizing, it actually is, and far less intense and fishy than you may surmise from that brief description. It’s often used as a condiment of pasta dishes and you should really try it at least once in your life. The 2012 Rocca del Principe Fiano di Avellino is also lemony and mineral, but with hints of tropical fruit that speak of ripe Fiano grapes. Mercifully, this wine is not at all over the top, as the greatest Fiano wines are always discreet and refined, never having too much of an overtly tropical fruit character. 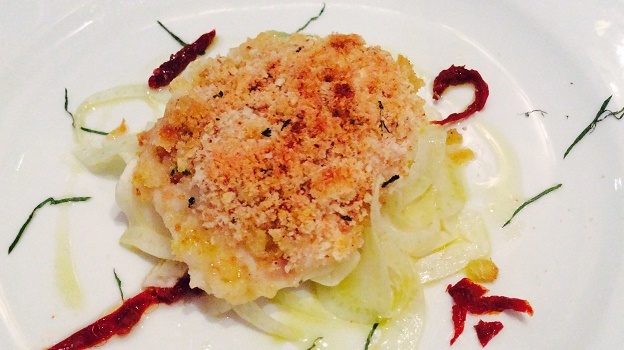 The more savory, flavorful pasta and fish dishes that followed required something bigger. I zeroed in on a bottle of Italian wine history, the by now mythical 1999 Montevertine M Vino da Tavola Bianco made by the late, great Sergio Manetti, a blend of Trebbiano Toscano and Malvasia Bianca Lunga Toscana. First made in 1982 and then for a few years only (until 1999), it’s an extremely complex and deep white, with aromas and flavors of wild fennel, dried apricot, orange peel and baked apple. It’s still vibrant (no doubt thanks to Trebbiano Toscano’s high natural acidity) and mineral today, and proves to be the perfect foil for the pasta and fish choices. The 2000 Zind Humbrecht Pinot Gris Rangen de Thann Clos Saint Urbain (for my money, the Clos Saint Urbain is ZH’s best wine) is still a little too sweet and rich for La Caravella’s type of cuisine, but it matches very well with the fennel and fish preparation (better than I might have imagined), and is the second best way to finish this absolutely glorious meal. So what, you might be wondering, is the best way to finish off dinner? 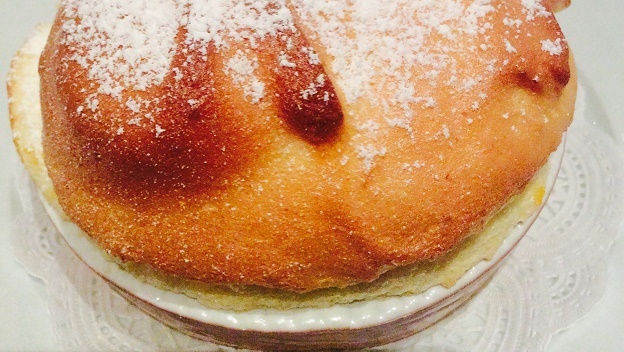 With La Caravella’s legendary Amalfi lemon soufflé, of course! It’s the stuff dreams are made of (and that you should order in advance when booking your reservation). Salvatore Quasimodo, the 1959 Nobel literature prize winner, described it as having “the sun in your plate.” I’m quite sure Quasimodo’s description is better than anything I could ever devise, and so we’ll just leave it at that.